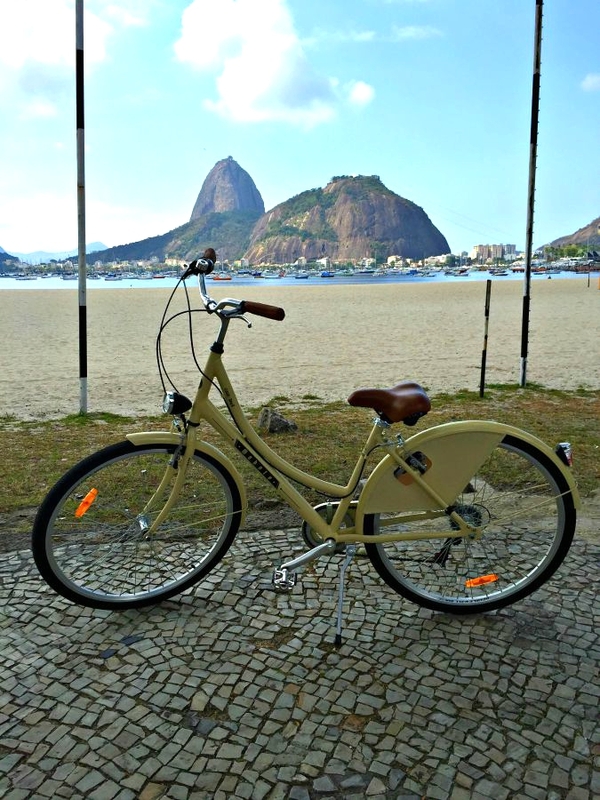 Riding a bike through Rio de Janeiro may be one of the best ways to take in the sights of this beautiful city. 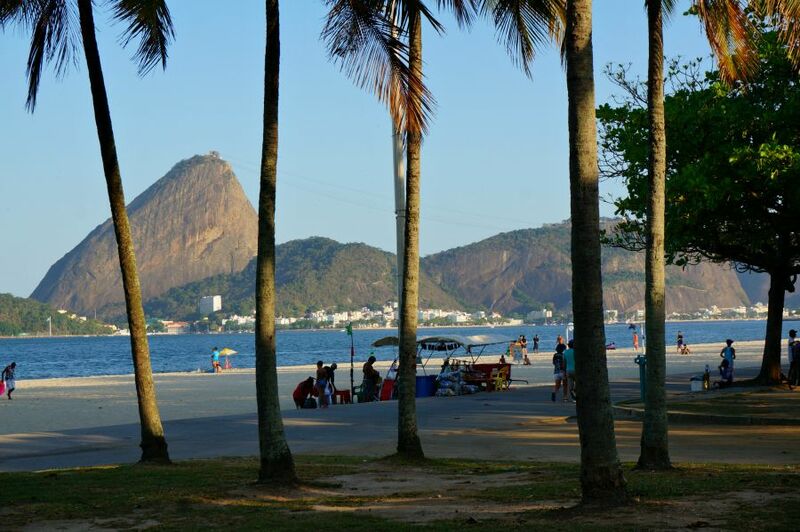 When you think about Rio, the image that likely first pops up in your mind is of the Sugarloaf Mountain (Pí£o de Aí§úcar) which juts up seemingly out of nowhere. In order for a mountain to come out of nowhere the area around it is going to have to be pretty flat. And in Rio de Janeiro, it is. For me, that spells p-e-r-f-e-c-t when I’m looking for a nice long bike ride with some fantastic views. And Rio delivers just that. View of Sugar Loaf from Rio bike path – nice and flat! 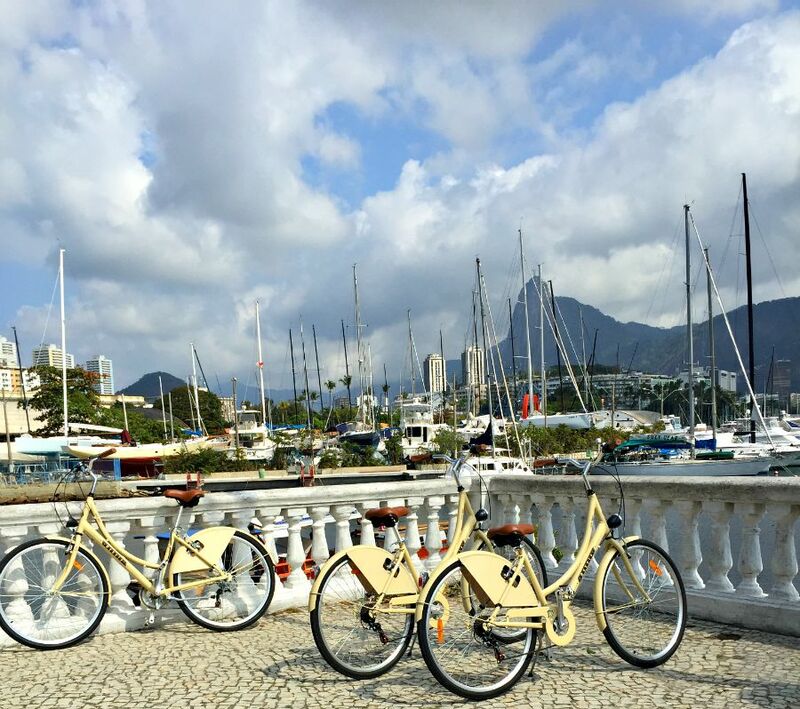 We took our bike tour with Philip of Rio By Bike. He’s actually from Holland but has been in Rio for eight years and has made it his permanent home. Side note: what is it with the Dutch and bike tours? We’ve taken quite a few bike tours and there is always someone from the Netherlands tagging along. In this case, we had a Dutch guide and TWO other participants from Amsterdam. Luckily for us, they were all fun. So anyway, even though Philip isn’t a native, we determined that he was quite qualified to lead a biking tour of the area. And as it turns out, he knew quite a bit about Rio. We started by the beach in Copacabana, gliding along and getting a look at plenty of guys selling photo opportunities of the elaborate sandcastles that they’ve made. 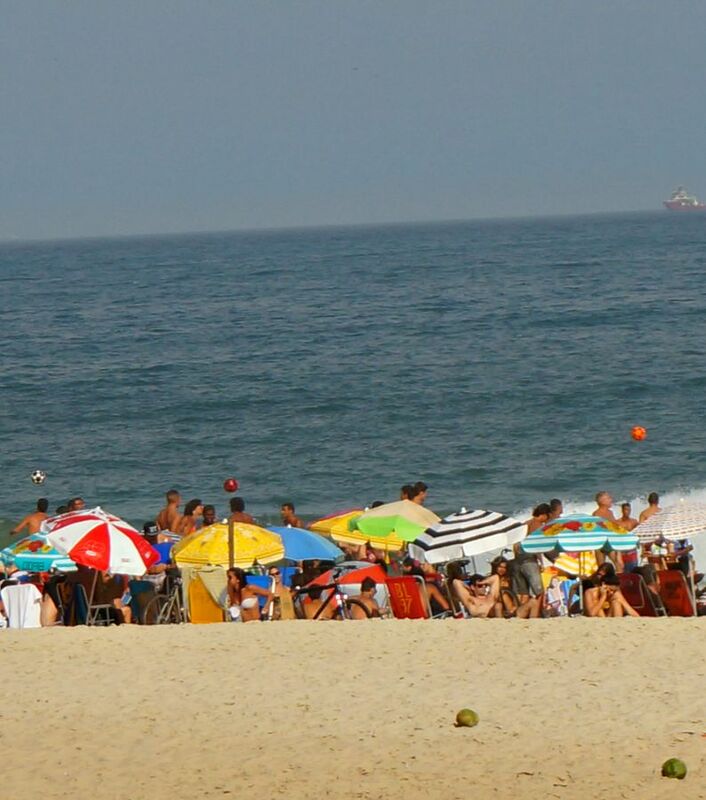 And also, you know you are in Brazil when you see bouncing soccer balls on the edge of the shoreline, jumping in the air like popcorn. Philip explained that much of the land around Rio is flat partially because it has been “reclaimed.” Acres of beach have been added to Rio’s shoreline by dredging sand from the water and piling it onto the beach. That’s also the reason that when you get ready to wade into the water in Rio you’re over your head very quickly. I even saw some kids doing back-flips into the water right from the shore. Before going into the sights, and there were a lot to take in, a word about the bikes. They are known as an easily maneuverable “granny bikes” – which was reassuring to me. I don’t ride a bike often (pedestrians in my path beware). Although, according our guide the granny bike in Holland sometimes have the unintended detracting factor of being motorized. Grannies are therefore able to pick up enough speed that they surprise motorists by who aren’t expecting the gray-haired rider to maneuver so quickly. This has caused the occasional car vs. granny collision. Oops. 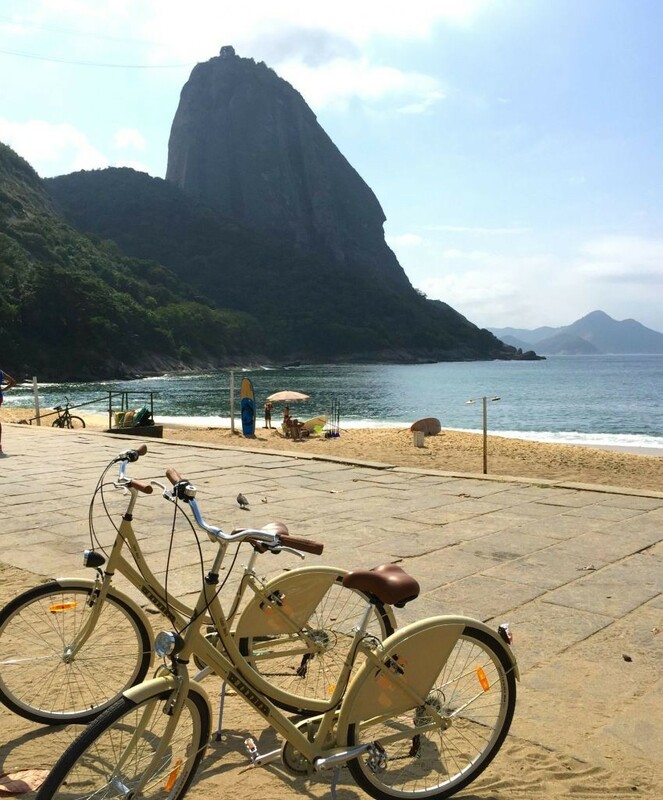 We peddled our way to Praia Vermlha – a beach favored by locals with some fantastic views of the Pão de Açúcar. Then through picturesque pathways with views of the marina. Passing the marina for photo ops with the Redeemer – can’t leave Rio with one! Along the way we found some pretty impressive street art. 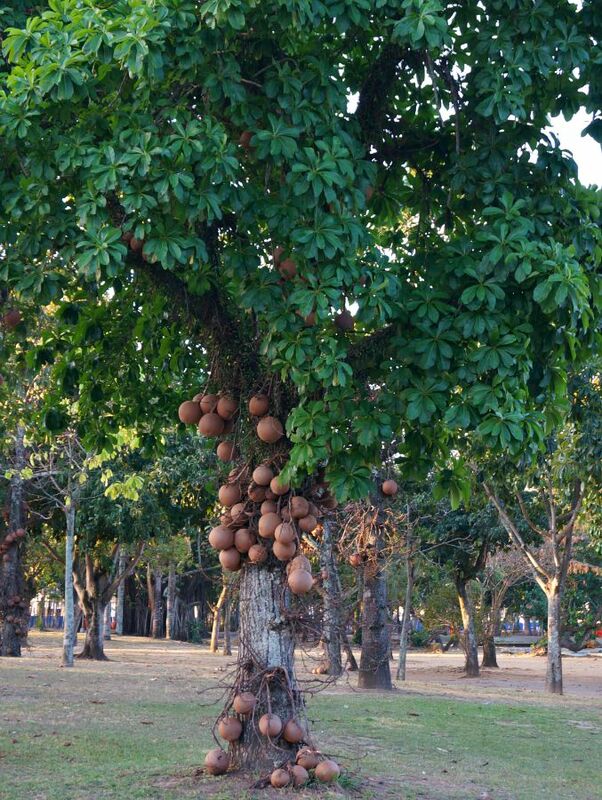 We were accompanied by the sounds of parrots chirping – a constant sound in Rio. 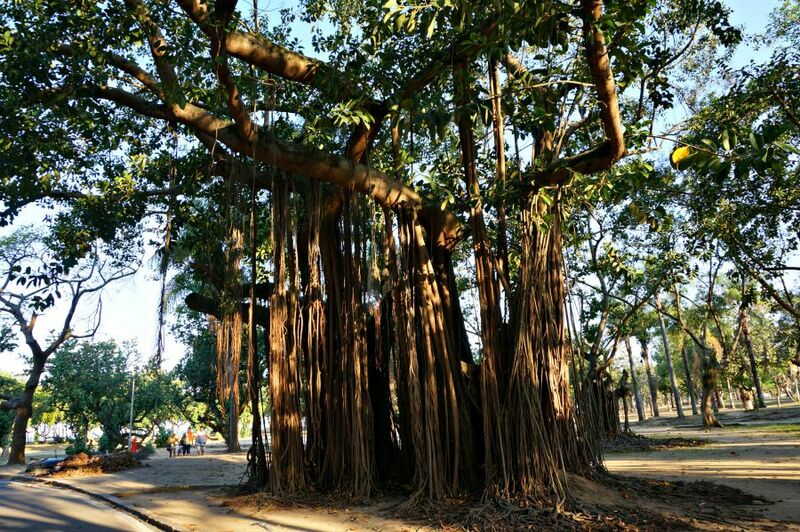 We were also treated to a view of many interesting trees in Rio, where I found myself trying to catch sight of a spider monkey, who are known to camp out along the beach. No such luck this time. We visited the lively Botafogo neighborhood, where we stopped at a neighborhood bar. In Rio, these establishments are a hub of social life. You can find people here stopping for a drink or a meal any time of the day (but most often in the evening after work or on the weekends. All of the bars have plastic chairs and tables so that they can expand onto the sidewalk when more customers arrive. And they all have TVs for watching Rio’s favorite soap operas (Philip explained that Brazilians are crazy for their telenovelas) or watching a soccer match. 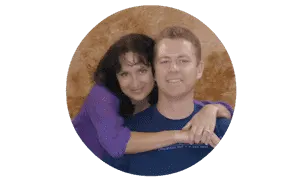 Even as a foreigner you can stop by and you’ll be treated like family. It’s one of the things that make so many people fall in love with the place and decide to move here – just like Philip. Along with the bike tour Philip also gave us great recommendations about places to go and off the beaten places to eat that were fantastic. Seems that the hospitality of Brazil has rubbed off on him. Get in touch with contacting him at Rio By Bike and see if you agree. 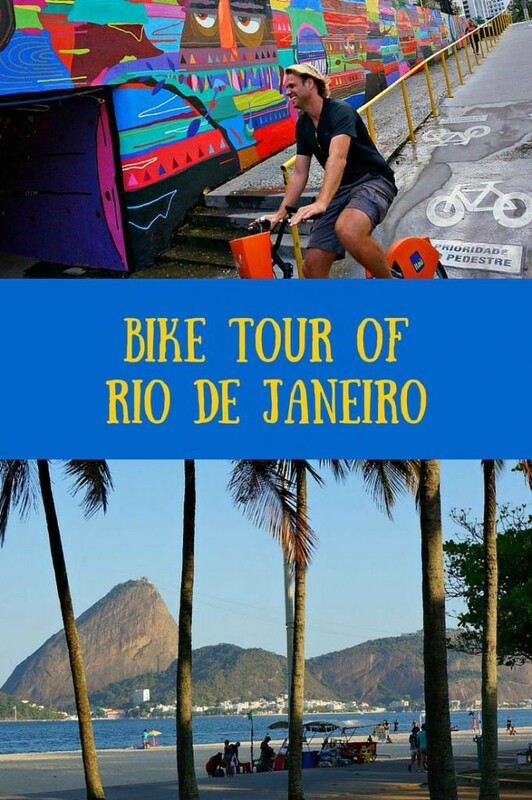 A special thank you to Rio By Bike who provided us with this tour. As always, our opinions are our own. You two always find the best guides. I’m glad to see you don’t have to be a tour de france athlete to do a bike tour. Granny bikes or stepovers – whatever;) actually even when I was in my teens I cycled a bike with no crossbar – you can’t wear a skirt otherwise. Love the photography – I haven’t been to Rio, but I’d really jump at the chance! You should definitely visit Rio. Great city, and the people are incredibly nice. Definitely. It’s a great way to see the city. Haha the Dutch do love to ride their bikes – don’t bikes actually have right of way above everyone and everything in Holland? We love to do bike tours, it’s a great way to see a city, get some fresh air and some exercise. 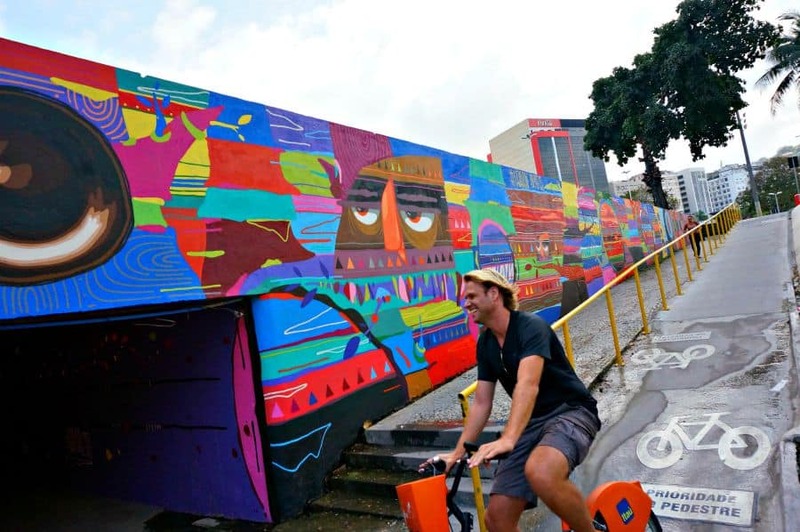 Sadly when I was in Rio I was on a bus tour – boring! I think I need to go back and do it properly! I really like bike tours, you get to explore at your own pace and at a good pace.Excercise + Exploring= perfect combination. I like the street art portion of it. 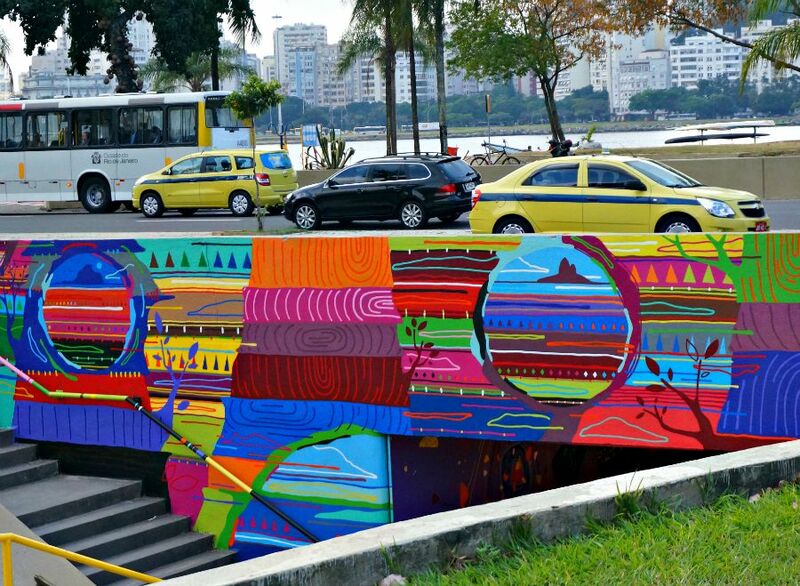 Rio had some amazing street art, throughout the city. It was always fun to turn a corner and see something new. Cycling is such a good way to get the feel of a city and even better with a guide who can give you the history. Looks like your tour had plenty of great photo stops too to enjoy the scenery. Good point about the stops – that’s a key part to doing one of these tours. Your photos are amazing. Pity I’m terrible at cycling. We loved it too! The cycling was really easy, so you wouldn’t need to be an expert. And, thanks for the props on the photos! I think that because biking is so popular in the Netherlands, that the Dutch just automatically think about doing bike tours. Biking around is a great way to explore the city! I haven’t been to Brazil, so this would be a good idea! That’s pretty awesome that Philip fell in love with Brazil and moved there! 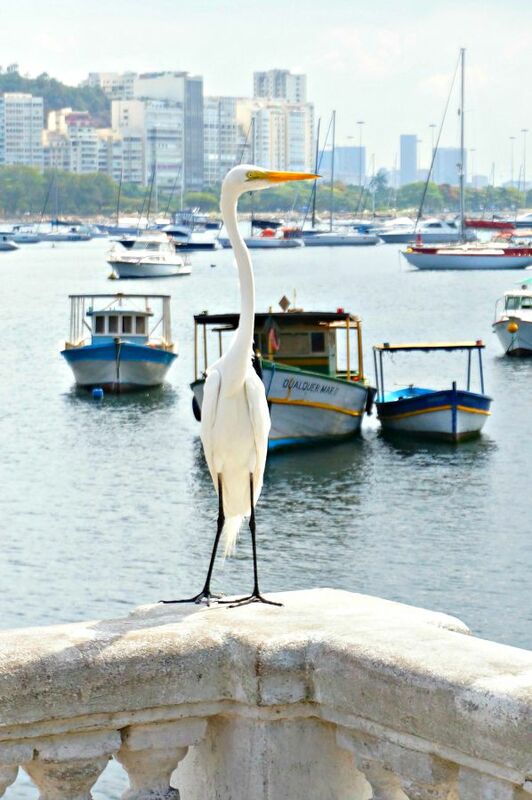 It seems that he indeed know a lot about Rio, so you got a great guide! There are a lookout of bikers in Netherlands and Holland by the way! 🙂 I’m impressed! Thanks! 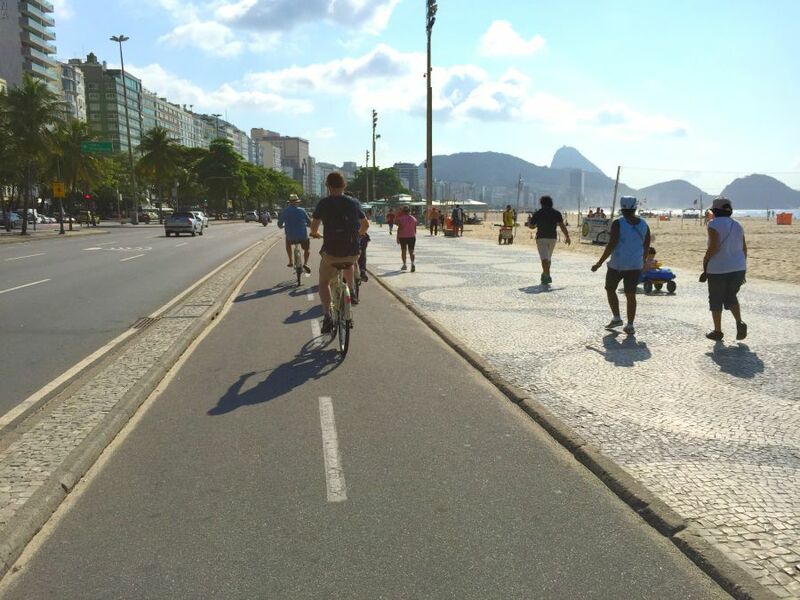 I think we’ll be doing more of these bike tours – especially where it’s flat like Rio. 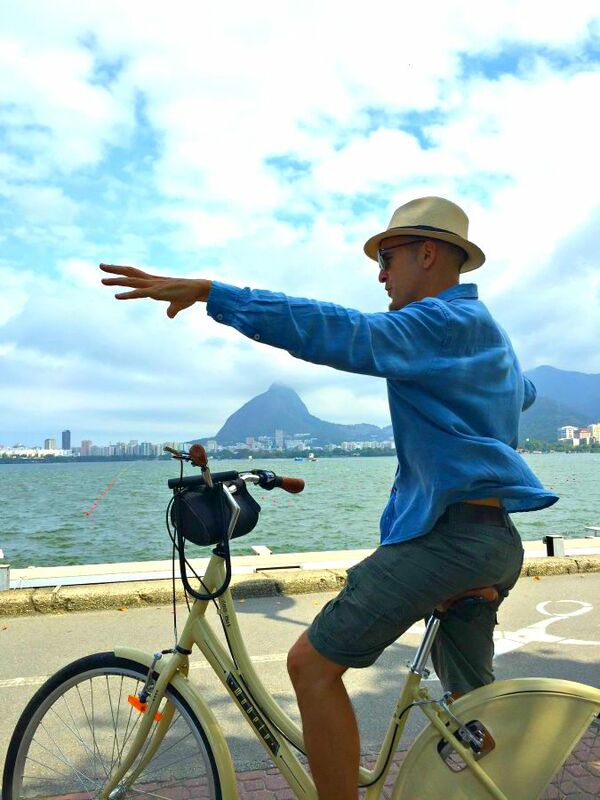 Sounds like you had a fabulous day – we love renting bikes and taking in a bike tour when we hit up a new city, there’s just something much more enjoyable about taking a bike for a spin as opposed to joining a walking tour!! 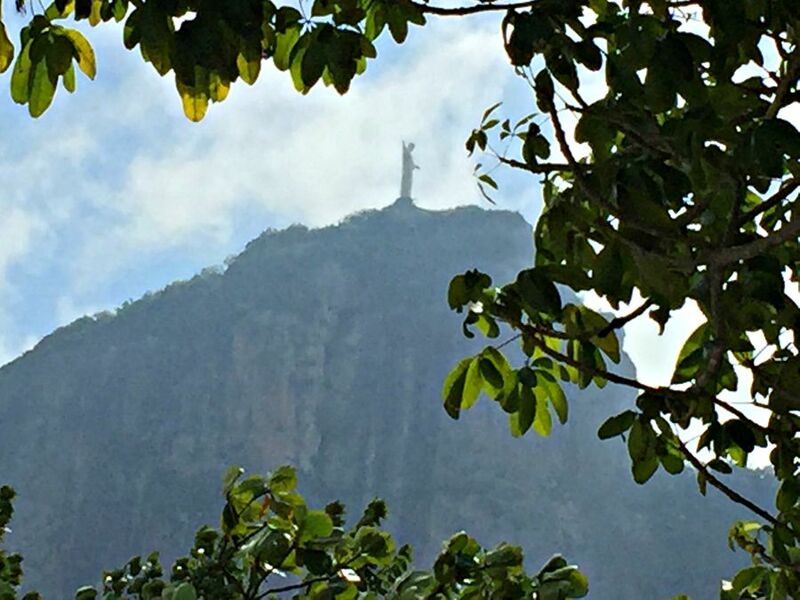 And totally agree – you can’t leave Rio without stopping for a snap of Christ the Redeemer 😀 Glad you managed to get a snap of the view during your tour! Yep, you can cover so much more distance on the bike than walking, it’s a great way to see things if you have limited time. Bike tours are becoming so popular all over the place! Some places even have bikes that you can rent for the day or by the hour. It’s such a great way to see the city and stop along the way for lunch or taking in the sights. 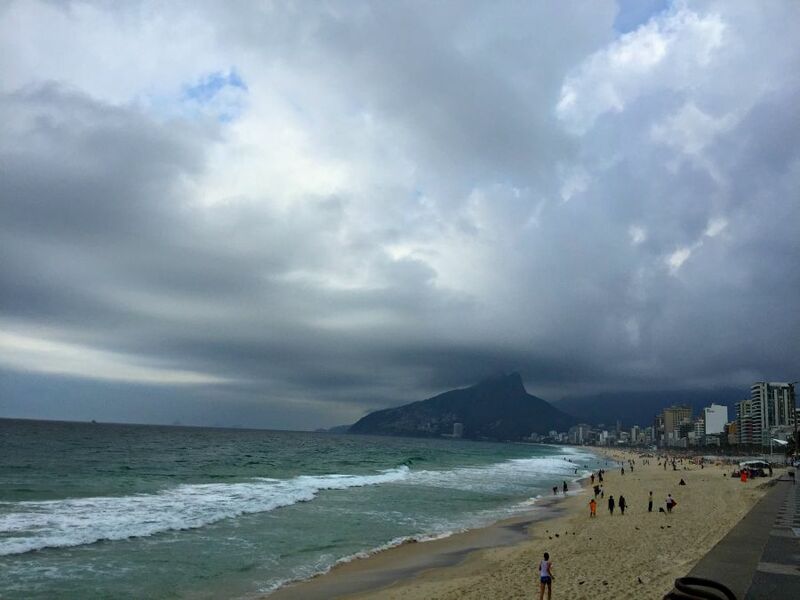 Rio is so beautiful and vibrant, I bet you had an incredible time! Yes, bike tours are one of our new “things”! Love it! I must say I once had an accident on a bike tour in Georgia (the country, not the state) which ended pretty badly and ruined my vacation… though I am just generally accident prone. We did not have “granny bikes” though.. are those safer options? It’s the first I’m hearing of them.